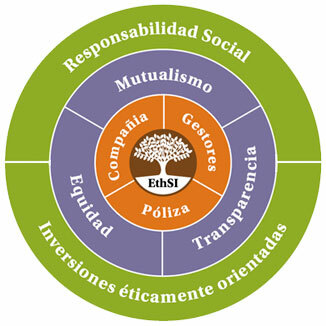 The European EthSI (Ethical and Solidarity-Based Insurance) mark is a distinction valuing quality in the management of insurance companies, brokers and managers. It also certifies the insurance products of registered organisations. The mark values the ethical management of the organisation with respect to investment and social responsibility and the promotion of social and environmental sustainability and transparency. The EthSI stamp assesses the adoption of a set of criteria established with the aim of offering transparency in the insurance market, promoting the development of ethical insurance and providing users with a tool to choose the product that best matches its values. Insurance is a type of financial industry service consisting of a contract between two parties: the insurer (which offers the service) and the insured party (which requests it). The purpose of the agreement is to guarantee an agreed compensation or benefit if the insured property is damaged or the insured person is injured in any way established in the agreement. In this way, insurance protects us from the consequences resulting from particular situations which may or may not happen during our lives. What is the value of mutuality? Guiding the insurance market on ethical and solidarity-based practice means recovering the principles of the insurance movement, especially mutuality. Mutualist awareness is based on links of solidarity between people and the original meaning of insurance was, precisely, to establish these links between the members of a community. These relationships created between those who are fortunate enough not to have suffered damage or injury (accidents, illness, destruction of property, etc.) and those who, by contrast, have to go through such experiences, allow all members of the community to benefit from insurance cover, regardless of the potential risk. Any person may need insurance at any time and, according to this mutualist criterion, there can be no discrimination between the people requesting these services based on age, disability or other social factors. Why is insurance important in a community? Insurance must be understood as a beneficial service for the community and the local area. We are talking about a community that does not abandon its members to their fate and works to have solidarity- and subsidiarity-based instruments available to deal with situations of adversity its members may face. For a community, this is desirable in order to have the solution to its problems available, to prevent such problems or to resolve them quickly without a gap opening up between those who have the financial resources to deal with them and those who do not. This is one of the mechanisms making it possible to prevent social inequality. The mutual nature of insurance and the way it is present in the community is assessed in products using criteria applied in terms of social and environmental sustainability and criteria on insurance and management organisations. What is understood by fairness in insurance? Based on a mutualist and community approach to insurance, an insurance agreement must be a contract between equals. In this way, the insurance company and the insured individual or organisation have the same consideration and imbalances of power cannot become established between them, either because of the conditions under which the product is offered, bureaucracy making it difficult for the parties to understand it, and so on. So, the function of the companies and managers is to inform people and organisations so that they are aware of their rights. The idea is to promote a virtuous circle promoting reciprocal respect by both parties of their duties. So that this process can be carried out, transparency is crucial and must be reflected in the institution’s policies and activity. In the specific case of contracts, providing information on the service clearly, comprehensively and on time is essential.